Any organization is judged by the metrics of what it accomplishes each year. In the non-profit world, things are no different. While we do not measure our successes in stock value, we are responsible for accomplishing our mission goals each year, and serving the public that we are chartered to help. Many people and organizations watch what a non-profit does, from the IRS who grants an entity’s non-profit status, to oversight organizations that rate non-profits, to donors who measure you against other potential worthy organizations for their philanthropy, to the most important group, those that you serve. OCF is very proud of our accomplishments over the years, even in the early years when we were just the seed of an idea, with only one person working towards changing the oral cancer paradigm in the US. The old adage that if you show me your friends, I will tell you everything about you can be so true, and the foundation has had many important friends over the years that have chosen us to be a component of their effort, events, or their strategic partners. We began to get a sense that we were having some impact when important national publications asked us to comment on the oral cancer issue in their magazines or periodicals, and over the years we have been profiled, or asked to contribute articles or provide perspective and opinions in hundreds of these kinds of venues. From dental trade publications to major newsprint such as USA Today, The Wall St. Journal, and the Boston Globe, OCF’s opinions and name were in the media consistently. The very first was Dental Abstracts Magazine, for whom we wrote an editorial on the value of early detection and diagnosis. A showcase article on oral cancer, OCF, and Brian Hill in USA Today, the largest circulation newspaper in the US, shortly followed that. The Boston Globe did an article on “Contagious Cancers” which looked at the HPV issue and showcased OCF and its efforts to raise awareness of this new etiology. There have been hundreds of mentions, references to OCF as the source of information, and stories that painted OCF in a positive light, and they are too numerous to mention individually. Clearly these outside venues were acknowledging the foundation’s credibility and value as a trusted resource. TV shows such as Good Morning America told the oral cancer story, and in that case and many others to follow, the foundation provided all the background disease information as well as contacting patients, survivors, and doctors to appear on the shows. More and more the foundation was being selected as the credible source, with trusted information. We are very proud that many fine news, magazines, and public dialog TV media have chosen us to partner with them to ensure the public hears an important story. A couple of year’s into OCF’s existence, even as a micro entity, the foundation was getting noticed. Brian Hill, OCF’s founder was asked to be the keynote speaker by the World Health Organization (WHO) at their large World Conference on Oral Cancer, held in Crete. Given the size of OCF at the time this was quite an honor, that so large and powerful an organization had taken note of our work. The foundation produced two public service announcements for TV the next year with legendary multi Emmy award winning actor Jack Klugman, and with Tony and Emmy award winning actress Blythe Danner-Paltrow. Both played for runs of more than 120 days each on hundreds of TV stations across the country, and each received more than 34 million viewer impressions. That same year the OCF and founder Hill, were honored at the National Press Club with an award from the NIDCR, part of the National Institutes of Health, for excellence in public service, and the foundation’s work with these celebrities to bring much needed awareness to the oral cancer cause. OCF’s founder, Brian Hill was again singled out for a prestigious award for his impact through OCF by New York University, and was given their prestigious Strusser Memorial Award for public service during ceremonies at Madison Square Garden. Many notable people from surgeon generals to celebrities have been the recipients of the Strusser award. In the same year, OCF was recognized with an award from the Chicago Dental Society for its contributions to the battle against oral cancer, the George H. Cushing Award. This award recognizes those who contribute in a significant way to raise national public awareness about the importance of oral health. HPV Awareness.org, founding member of this international effort. With all the knowledgeable and articulate people in the oral cancer world to choose from, it is an honor to be selected by these groups to share information and opinions, and guide the direction of upcoming trials. After many years of working with researchers and lecturing, Mr. Hill was on the radar of the American Academy of Oral Medicine. 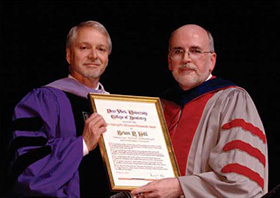 He became the first non-doctor to be invited to join and was inducted into that organization by his long-term friend Dr. Ross Kerr, the organization’s 2014 Vice President. 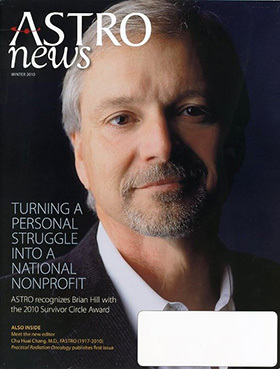 The American Society of Treating Radiation Oncologists (ASTRO) selected Mr. Hill for their Survivors Circle Award, and his image graced the cover of their magazine with a corresponding story, and an invitation to address their annual convention. The award was given to Mr. Hill by his long time friend, radiation oncology mentor, and original treating radiation oncologist, Dr. Kian Ang, then president of ASTRO. Getting support and engagement from those in the entertainment community can be difficult. Most celebrities from the movie and TV industry shy away from intimate involvement with organizations. Clearly their reputations are at stake every time the organization does anything. OCF has been very lucky to have the friendship, endorsements, and participation of wonderful individuals from this area. The foundation¹s first partner was multi award winning actor and head and neck cancer survivor Jack Klugman, who partnered with OCF to appear in our first TV public service announcement. That PSA received more than 30 million viewer impressions on TV stations around America in a 90 day run. In that same year Emmy nominated actress Colleen Zenk, an oral cancer survivor became a spokesperson for OCF, appearing in TV PSA¹s and on TV talk shows. OCF worked with Ms. Zenk and her producer on the long running series As The World Turns, to incorporate a new story line for Colleen’s character. Her character developed oral cancer from an HPV viral infection, went through treatments, and dealt with the speech issues and more after treatment. For four months on daytime TV, 5 days a week, the oral cancer story was told and played out in the TV series. This public awareness effort effort cost the foundation nothing financially, and it was fortuitous that while in recovery from her treatments and slurring her words still, Ms. Zenk was able to go back to work, in a role where her speech issues were actually a positive character trait. This is just one of many examples where OCF works in an obtuse way to accomplish its mission goals. The following year a relationship was built with the Paltrow family, with multi award winning actresses Blythe Danner, Gwyneth Paltrow, and producer / director Jake Paltrow launching the Bruce Paltrow Memorial Fund within OCF’s structure in memory of their father who was lost to our disease in 2002. Ms. Danner has produced her own public service announcement with OCF besides appearing on many talk shows promoting the foundation, its April OC Awareness Month, and speaking about the rise of HPV as a cause. Ms. Danner’s TV PSA has run two times on national TV for 90 days each, and during each run has been viewed more than 30 million times. Katie Couric, Rachael Ray, Good Morning America, and many others have invited her on their shows to further the oral cancer cause and speak about OCF. Ms. Danner serves on the OCF Advisory Council. Academy Award winning actor Michael Douglas, joined those making TV PSA¹s with OCF, and as a survivor has been willing to help the foundation in its¹ many endeavors. His TV PSA received over 40 million viewer impressions during a 120 day run on national TV. He also serves on the OCF Advisory Council. All these celebrities have also been donors to the foundation helping to further its many missions. Behind the scenes, Hollywood heavyweights including Ms. Lisa Paulsen, CEO of the powerful Entertainment Industry Foundation, and Ms. Sherry Lansing past president of Paramount Pictures, who along with Ms. Paulsen and others is a founder of the hugely successful Stand Up 2 Cancer organization, became official advisors to OCF. As vocal advocates or as advisors to OCF, these individuals use their celebrity for public good, and to further OCF’s missions and accomplishments. In 2009 OCF was chosen by non-profit industry oversight organization Great Non-Profits as the best small cancer non-profit in the US, regardless of cancer type. When measured against several hundred other organizations, OCF was presented with this award for our work directly with patients and family members, through independent reviews. Every year since that award, OCF has been in the top ten cancer non-profit group at Great Non-Profits, regardless of organization size, which is a significant accomplishment when you consider the millions of dollars a year that some of the others bring in to accomplish their missions. Mashable.com, a highly regarded technology industry observer, showcased OCF and its many Internet based efforts, but zeroed in on our groundbreaking use of a newly developing technology at the time – the QR code, which is scanable from smart phones to take the user to dedicated content. OCF’s idea to make temporary body tattoos of the unique code, which had never been done before, and put them on people at the more than 500,000 attending National Surfing Championships in California, was heralded by technology magazines and other industry observers. On a very small budget OCF reached the target young audience with a video on HPV and oral cancers, through an emerging technology, in a manner never done before. While we are proud of all these accomplishments, the accolades that stand out as the most important to us at OCF are the ratings on the Great Non-Profits web site. Almost 300 reviews of the foundation, the vast majority of them written by individuals that we have served who have faced the challenge of an oral cancer diagnosis, tell the story far better than any accolades page we might write or any award that we have received. Comments that refer to their interaction with the foundation as “life changing” or that they “don’t feel that would have been able to navigate and survive their disease without OCF’s support,” make all of us at OCF choke up when we read them. The adjectives describing OCF used in so many of the comments are striking. “Awesome, helpful in a profound way, invaluable, I can’t overstate the impact OCF had on me, an amazing organization, incredible expertise, remarkable individuals at OCF, no words to express my gratitude to OCF,” and many more touching comments from real people, are what this is all about. No plaque on a wall, no mention of accomplishments in advancing the cause from an important publication, nothing else will ever speak to the work that the foundation does in so profound a way. While we have finally decided to put up a page that lets people know what we have done that was noteworthy over more than a decade, we are humbled by what those we serve have to say about us. You can read some of these reviews here. In 2015 the foundation embarked on a new initiative to return to its roots in the fight against tobacco. Realizing that tobacco use and initiation of tobacco use was very strong in rural America, the foundation formed a partnership with two young, up and coming rodeo competitors. As athletes in every sense of the word, and non-tobacco using spokespeople for the foundation, they competed in rodeos across America. Clad in OCF branded westernwear, they spend their non-arena time talking to children at the rodeos about not starting the tobacco habit. The slogan was “Be Smart. Don’t Start” and they were a hit. As the first charity of any kind to be the primary sponsor of a cowboy who rode bucking broncos or for that matter competed in any rodeo events, the programs got widespread publicity. Magazines inside and outside the western world picked up the stories and soon thereafter the TV morning talk shows saw the two being interviewed about their mission. OCF has always believed that if you wish to solve a problem and effect change you have to go to where the problem lives. This was a typical example of that thinking, even when others suggested that we would not be welcome nor would this be successful. Now in its third year, the program has talked to thousands of children who leave the conversations with a custom OCF bandana to wear, and a role model to look up to that is a fierce competitor in the ring and wins without tobacco being part of that effort. A major oral cancer event in 2016, the Global Oral Cancer Forum, held in New York City, brought together oral cancer luminaries from 44 countries around the world. Those presenting and attending included academics, clinicians, activists, industry partners, survivors, government officials, and other stakeholders. OCF’s founder Brian Hill, was one of the presenters asked to speak at that meeting, addressing the mechanisms by which the non-profit community could have a disease impact outside the realm of patient support that most are so well known for. While being asked to present at this meeting was an honor in itself, Mr. Hill was singled out to receive the sole award presented at the forum, an award for “innovaton and leadership” presented to him by long time friend and mentor Dr. Michael Alfano, executive vice president emeritus, New York University. Recognition at a global event from a body of individuals that he felt were the thought leaders in oral cancer, “was a humbling event, for someone who considers himself only a journeyman in their company” said Hill. Clearly the impact of the work both personal and through OCF has had ramifications world-wide. In 2016 OCF also found a new high-profile partnership with the mega-band Coldplay and band member Chris Martin. This is a band that for years, regardless of what continent they are on, sells out stadiums to perform for tens of thousands of fans at each with routine. The band has won 62 awards from 209 nominations throughout their career, including nine Brit Awards—winning Best British Group four times—five MTV Video Music Awards and seven Grammy Awards from 31 nominations. Coldplay have sold more than 80 million records worldwide, making them one of the world’s best-selling musical artists. They also have a long history of charity efforts supporting many worthy causes; clearly they are not just musicians but a band with a strong social consciousness. OCF is grateful to be included as an organization worthy of this kind of support from them. Through this partnership and a relationship with celebrity experience auction house CharityBuzz, the band graciously auctioned off meet and greet experiences at three of their biggest concerts in stadiums across America during the Head Full of Dreams world tour to raise money for the oral cancer cause. 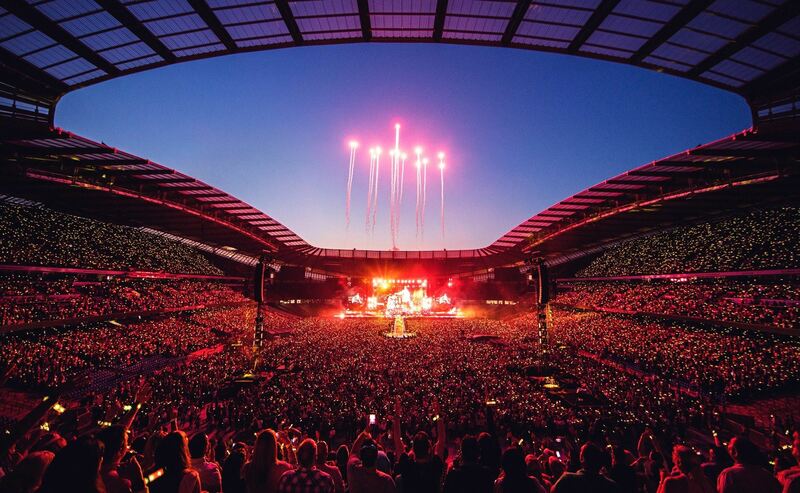 Coldplay has 50 million followers in the social media world, imagine what stories there about their charity work with OCF means to rasing awareness of the disease. What this organization lacks in infrastructure it makes up in the development of strategic alliances. What it lacks in raw dollars to get their message out, it makes up for in creative and innovative approaches, often convincing celebrity spokespeople to deliver its message. What it does not lack in is a true passion to serve the needs of others. More information about OCF activities and relationships can be found on our press release page.